General inquires can be made to Misch Whitaker at storieswithoutroofs@gmail.com or at 617-368-0356. If you would like to speak with an author of the show please contact Misch Whitaker as well to help schedule. The Program is called Stories Without Roofs. Officially Stories Without Roofs exists to give a voice to the voiceless by telling the untold stories of homeless, previously homeless, and transitioning men and women. We hope residents of the Boston/Cambridge shelter system will have their life experiences affirmed through the sharing of their stories - as they want them to be shared.Through the crafting of their own narratives, and then seeing their stories reflected back to them, the writers are free to discover fresh perspectives on their own journeys. SWR also strives to strengthen community bonds by inviting others to bear witness to these stories and to contemplate their meaning. Beyond SWR's mission the program also brings together many artistic professionals to help bring to life the work of these homeless residents in an annual live performance. Artists of all disciplines contribute their craft working alongside the writers to help communicate their stories to the public in the special way that only live performance can. The authors receive compensation for their writing, which both acknowledges their status as artists and reinforces their very active role in the creation of the production. WHO: Misch Whitaker is a Boston born performer, writer and director who believes that art, and particularly theater, is a powerful tool creating dialogue that inspires new ways of thinking about society. The majority of Misch’s own work is comedic. She most recently appeared in Ministry of Theater’s God Hates Musicals, and can be heard as the voice of Katie on Jonathan Katz’s web series Explosion Bus. Other credits include Improv Asylum’s NXT (2007-2008), Improv Asylum Mainstage (2008-2012) and ImprovBoston Mainstage (2012-2014). 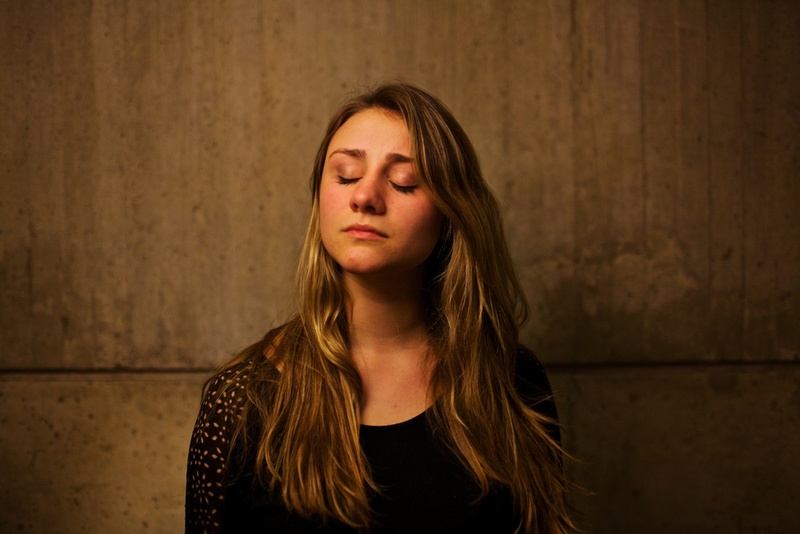 Misch currently performs weekly with Boston’s Unscripted Musical Project (Catalyst Comedy). She may be comedically inclined, but Misch's passion has always been social justice. She studied Social Thought and Political Economy at the University of Massachusetts before switching and graduating with a Bachelor of Science in Nursing. She is a registered nurse (RN), and has worked at Boston Healthcare For the Homeless for almost seven years. Stories Without Roofs is supported by the Ministry of Theater, an theatrical production company whose mission is to support independent artist projects outside of traditional for-profit or non-profit organizations. 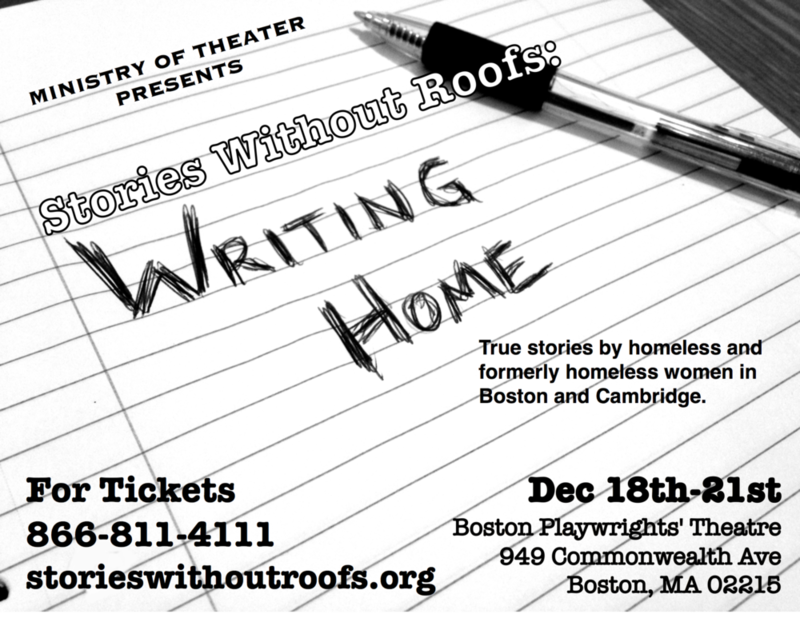 WHAT: Stories Without Roofs is an annual writing group program for homeless individuals that culminates with a live staged performance through professional performers in music, dance, visual art, and acting. SWR is just over one year and created Stories Without Roofs: Transitions last year working with a men’s group in partnership with the Salvation Army. This year’s production was written by an entirely female group comprised of individuals currently receiving support services from On the Rise, a day program in Cambridge for homeless women. WHEN: This year’s production will be at the Boston Playwrights Theatre at Boston University. A one week only production from Thursday December 18th to Sunday December 21st. Stories Without Roofs is a nonprofit social justice arts program for homeless individuals that uses writing workshops to generate a new play each year. Each project culminates with a live staged performance by professional performers in music, dance, visual art, and acting. SWR is just over one year and created Stories Without Roofs: Transitions last year working with a men’s group in partnership with the Salvation Army. This year’s production was written by an entirely female group comprised of individuals currently receiving support services from On the Rise, a day program in Cambridge for homeless women. The show was written by a group of women currently receiving support from On the Rise, which is a daytime shelter in Cambridge. Themes include family, identity, trust (or lack thereof), and overcoming life's obstacles and society's stereotypes of what it means to be homeless. The show will feature their true and original poetry, songs, essays, and monologues. Each show will end with a Talk Back with two of the authors. The run-time of the show is about an hour and twenty minutes. There is no intermission. What does “Writing Home” mean? The title of the show encourages audience members to consider the often subjective meaning of the word "home." It offers an almost playful blur between the idea of a “home” as a physical location (one that you might send a letter to for example, and therefore a place you can leave or even lose), and the concept of “home” as more of a feeling and sense of belonging that an individual may create wherever, whenever, and however they wish. Do ticket sales benefit the authors? Ticket sales and donations benefit the authors, and also all of the other artists and activists responsible for the production of Stories Without Roofs: Writing Home. The authors receive compensation for their writing, which both acknowledges their status as artists and reinforces their very active role in the creation of the production. How can I donate/find out more? Author names withheld for privacy and safety. To inquire about authors please contact us at storieswithoutroofs@gmail.com or call 617-368-0356.